The postseason has finally begun! 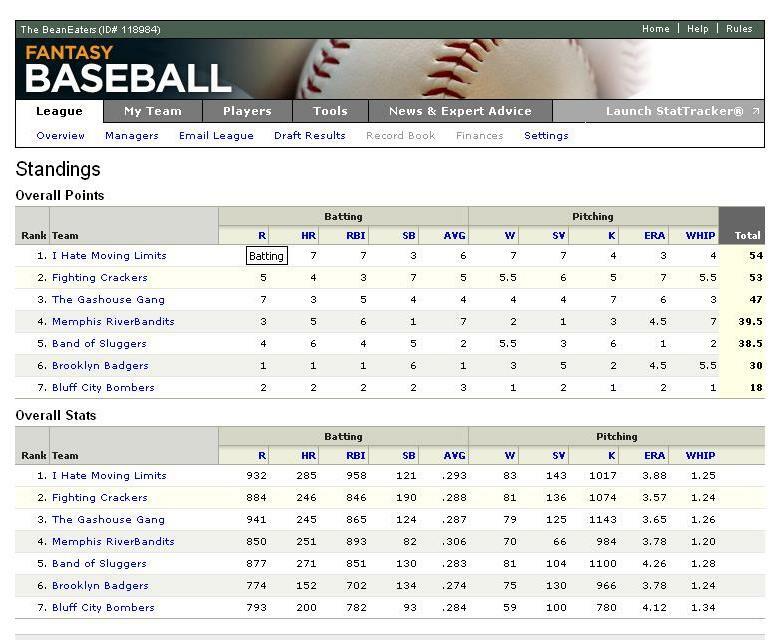 Better still, the regular season is over, thus fantasy baseball is finally over as well! I can finally relax and ignore the postseason because the Braves weren't even close to being good this year. Best of all, I can stop worrying about swapping relief pitchers and whether Aramis Ramirez will keep sucking it up for the rest of the year. Rich Harden never materialized, picking up Derek Lee was a terrible idea. Unfortunately, as the manager co-manager of the "Fighting Crackers" I'll have plenty of time to think about all of my missed opportunities, poor decisions, and limited baseball knowledge. And maybe next year, I won't have to share my team with Amber. She can have her own so that I can beat her. Regardless, congrats to Mark G for his stunning efforts, quality win, and annoying "victory speech." He really squeaked it out in the end. Too bad for Mark-- we were all too cheap to put any money on this league. Hey man! Good to hear from you. I know how it is, man. I'm in the middle of fantasy football. Wish me luck. 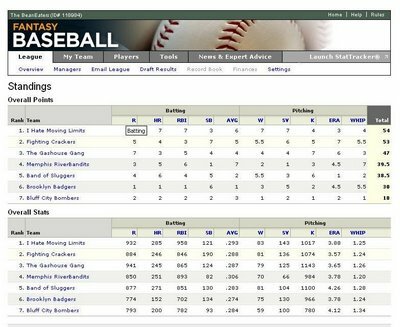 If I remember correctly, you are the CO-MANAGER of OUR Fantasy Baseball team! You can't beat me, ya brat! i'm sorry to hear you were demoted to co-manager status. At least you didn't get the Dusty Baker treatment. Plus, if you think sharing a fantasy baseball team is tough, try sharing a double bed and bank account... with the same person. on second thought... don't try it... yet.. .just take my word for it.